1st Stage: Polypropylene 5 micron Sediment filter- removes the particles, dust, mud, sand and more. 2nd Stage: GAC coconut shell activated carbon 10 inch filter- removes the chlorine, organics, odor smell, turbidity, colors and other VOCs chemicals. 3rd Stage: CTO 5 micron coconut shell block carbon filter- removes cloudiness, chlorine, odor smell and taste and other VOCs chemicals. 4th Stage: RO membrane- High quality TFC RO membrane that removes up to 99% of contaminants including heavy metal, salt, bad mineral substance, arsenic, chlorine, lead, fluoride, and other dissolved chemicals. 5th Stage: Inline filter cartridge quick connect- (polishing filters) removes all possible rough tastes and odors. 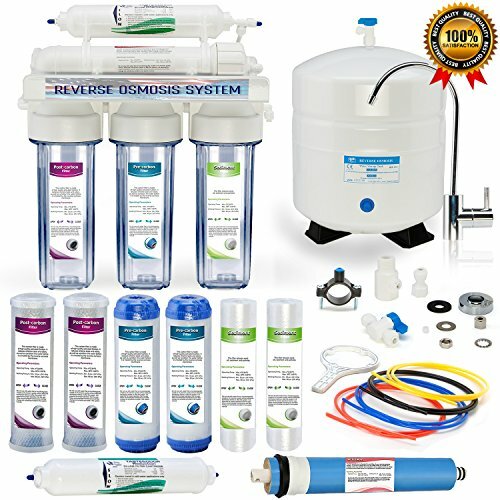 RO system + 2 sediment filters + 2 GAC activated carbon filters + 2 CTO block carbon filters + 1 Membrane + 2 Inline filters + Tank + Faucet + Colored Tubing + Installation Kit and Valves. Removes up to 99% of Contaminants such as chlorine, lead, bacteria, arsenic, fluoride, and other contaminants with high quality of filters. Premium Inline filter to provide clean, refreshing, and pure drinking water. Filters 1,000+ water pollutants such as chlorine and fluoride, etc. 100% LEAD FREE faucet & steel tank complies with NSF/ANSI standard 58 to provide healthy, safe, and pure water.